← What I learned in 2017 part 1: Get my ducks in a row! SFR Holiday Party on Facebook ~ $50 Amazon gift card + 14 sci-fi romances! Dec. 6! 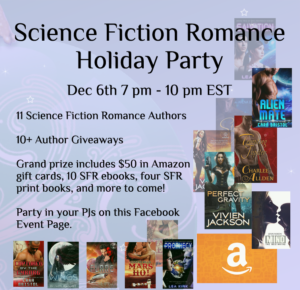 If you like science fiction romance, put on your jammies and join us on Facebook Wednesday night from 7 – 10 p.m. eastern time for the SFR Holiday Party. We’ll be giving away a grand prize that includes a $50 Amazon gift card and 14 sci-fi romances! Throughout the evening, each of the 11 participating authors will be giving away MORE prizes. This entry was posted in Contests and tagged alien romance, Cara Bristol, Facebook event, free science fiction romance books, reader contest, science fiction romance, SFR Holiday Party. Bookmark the permalink.